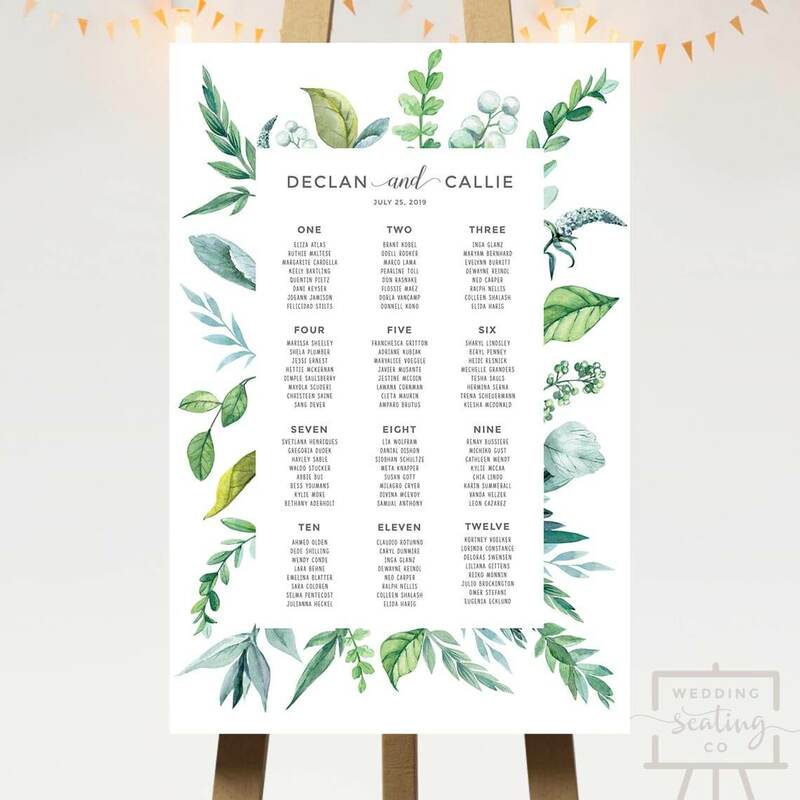 Welcome your guests with this floral table plan. 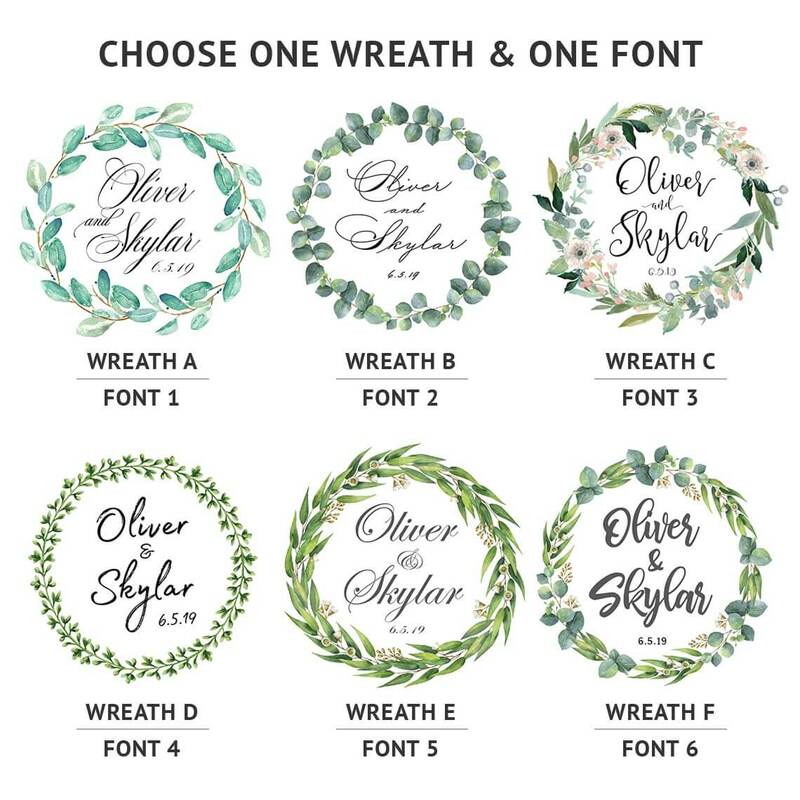 Colors and style of the flowers are fixed, but the font and background colors can be personalized. 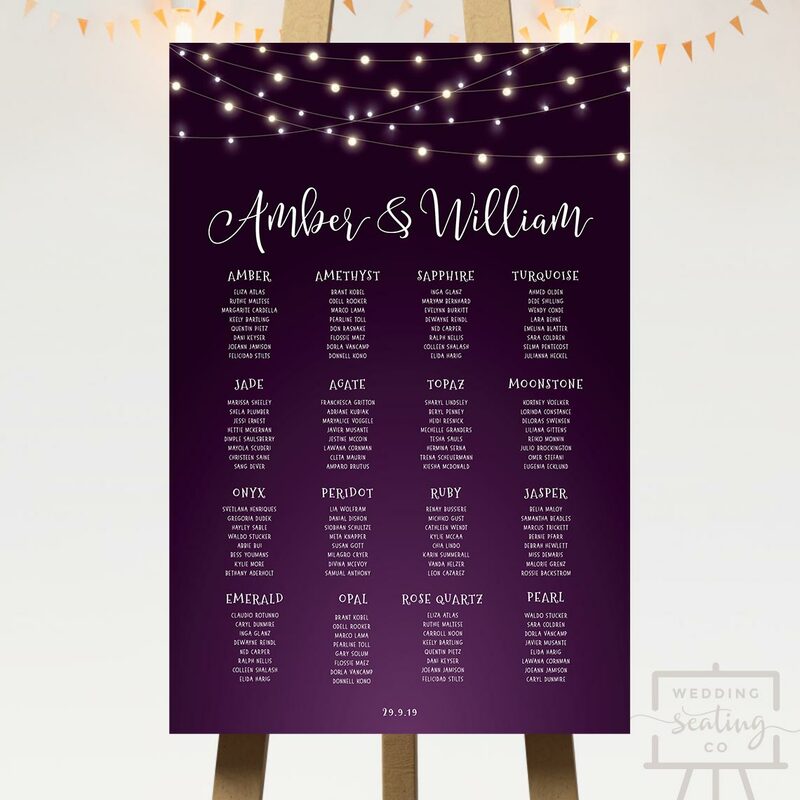 Remember to provide the names of the couple when placing your order. And a date too, but that’s optional. Digital PDF file customized for you. 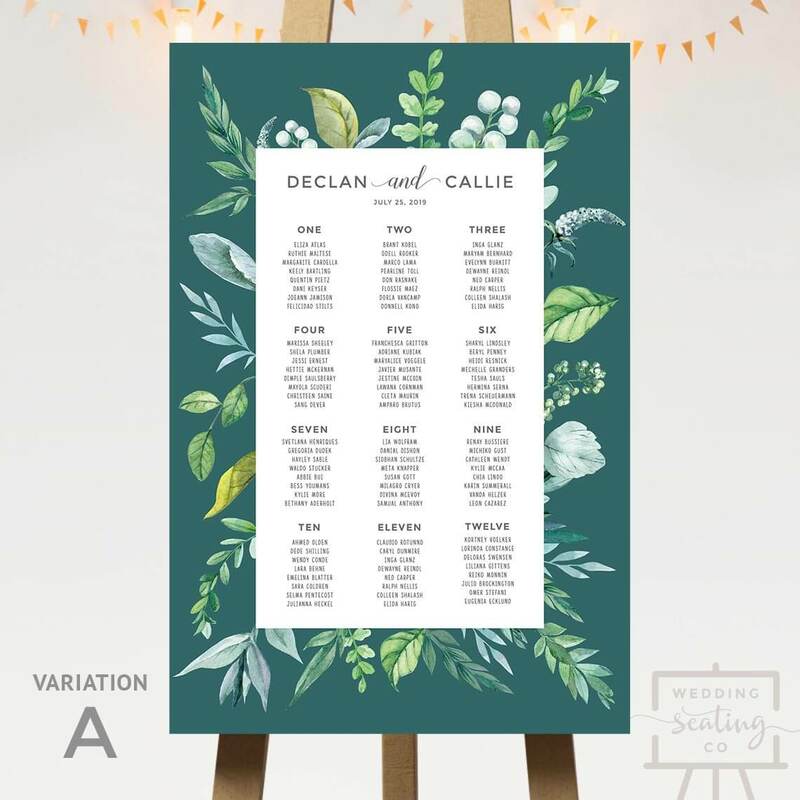 Scroll down for full details of Floral Wedding Seating Chart. If you chose Custom Colors, please select your colors below. Please acknowledge that you are ordering a digital file only. This is a digital product and no physical poster will be shipped. A high-resolution PDF file will be sent to you via email. 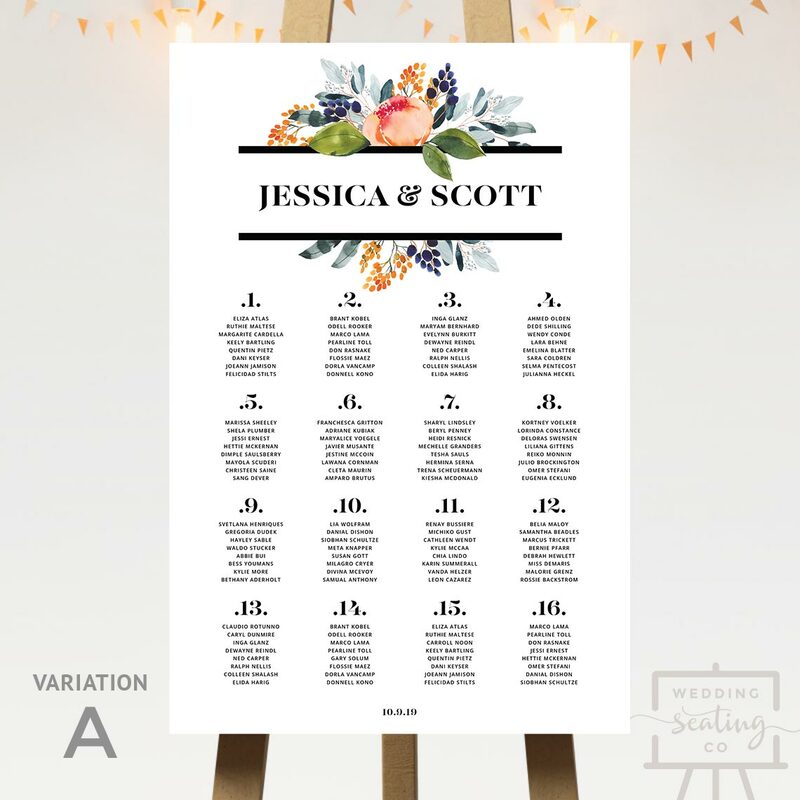 It will be customized with details of your guest list and ready for you to print. Standard processing time is 3 business days, Mondays to Fridays. Rush services are available for an extra fee if you need your seating chart within 12 or 24 hours. Make your selection on the checkout page. 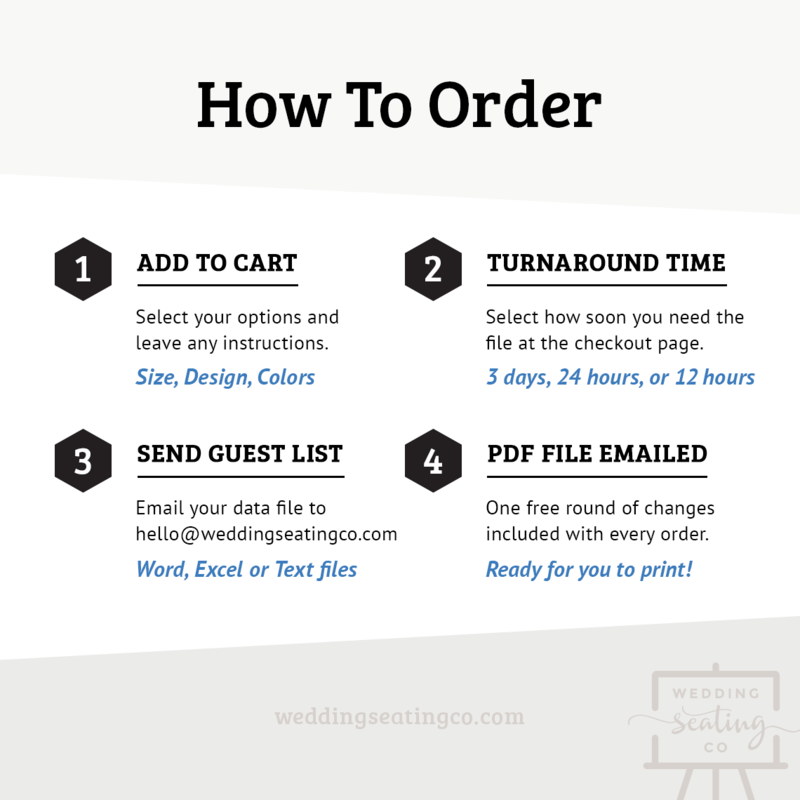 Email your guest list to hello@weddingseatingco.com as a Word, Excel or Text file attachment. Your guest list needs to be finalized and sorted. PDF files are not accepted. 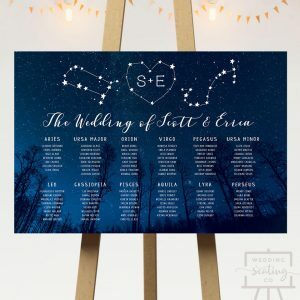 The size for your seating chart depends on the number of guest names you have. Here’s an approximate guide on the size you should choose. It is also a good idea to check with your printer if they offer the size you want. Tip! 24 x 36 inches is the most common size for posters. 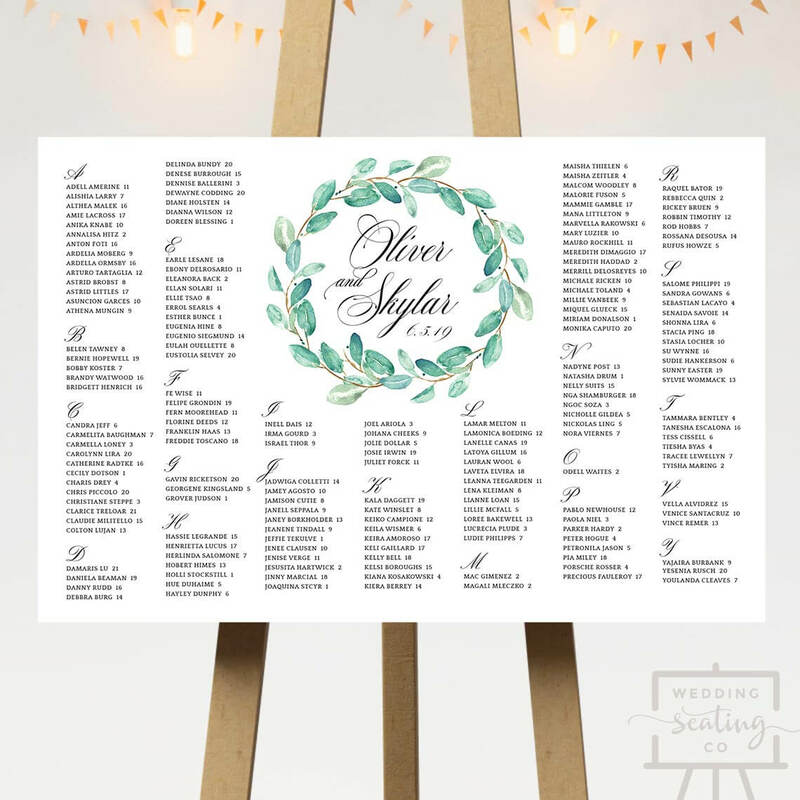 Your guest names can be displayed alphabetically, by table name, or table number. In the guest list that you email to us, the data should already be sorted and named the way you would like it to appear. 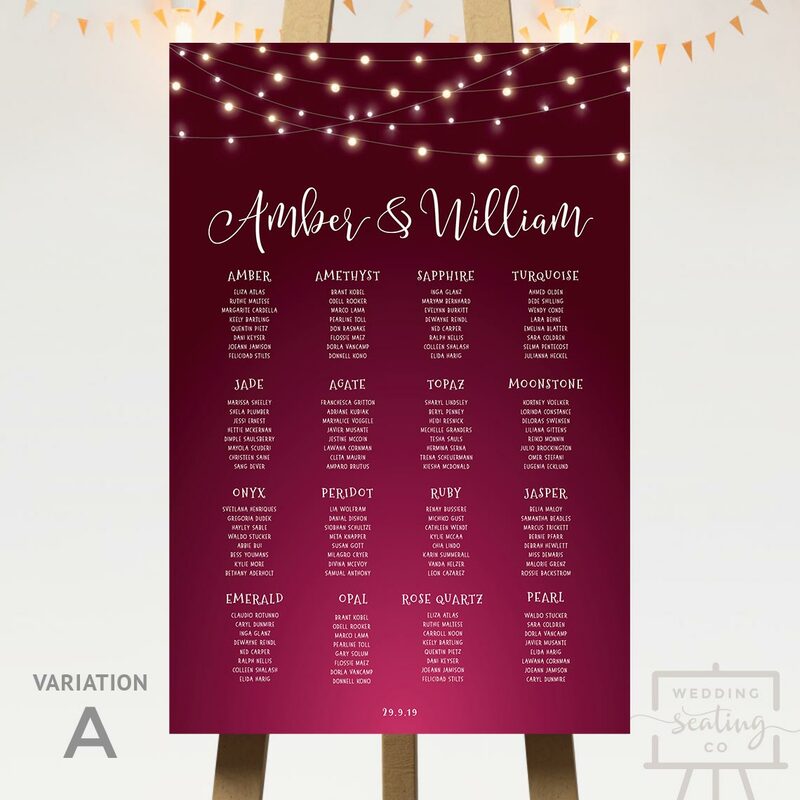 These are the add-on services available when you purchase this seating chart. We guarantee timely email delivery within the turnaround time that you select on the checkout page. Rush orders: Sent within 12 or 24 hours upon receipt of your order or guest list, whichever is later. Valid daily, including weekends and public holidays. 3 business days: Sent within 3 days upon receipt of your order or guest list, whichever is later. Valid Mondays to Fridays. Orders and submissions on weekends count as Monday orders. You can pay for your order via Paypal, or with major credit cards including Visa, Mastercard, American Express and Discover. Payments are securely processed through Paypal. Wedding Seating Co does not store your financial details at any time. Due to the digital nature of all our seating charts and the processing involved, orders are not eligible for refunds. Customer service is of paramount importance, so if you’re dissatisfied in any way with the digital file sent to you, please get in touch and your concern will be promptly addressed. Can I edit on my own? No, this is not an editable template. The seating chart will be customized for you with the guest list that you provide. Do I get a proof? In the interest of time, the high-resolution version of your seating chart will be emailed to you. Once you receive it, check that all the information is correct. If you find you need any changes or name swaps, please make a list and send it to us. Every order includes one free round of changes. Can you print it for me? No. 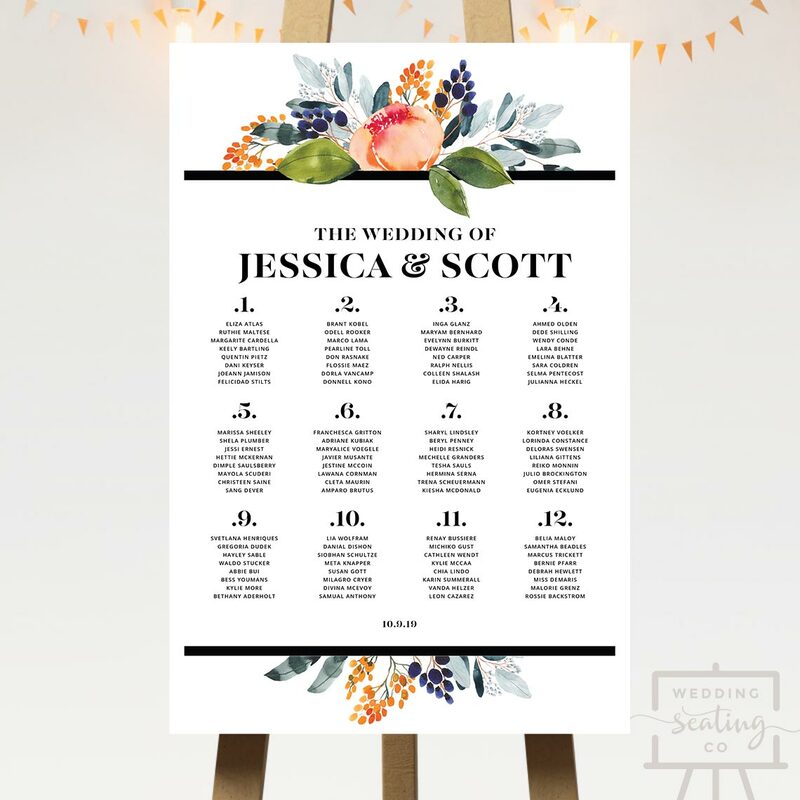 All products on Wedding Seating Co are digital files that you print on your own. We do not offer printing services at the moment. How should I print it? You have two options for printing. Upload the file to an online poster printing service. How can I send you my guest list?